Below are 50 free printable special needs word searches for children or adults. I made these puzzles myself. You may use these puzzles for any purpose (except sell them) as long as you leave the copyright notice on the puzzle page in place. This special needs puzzle collection includes 25 general-topic word searches (for example, "Memorial Day" word search) and 25 Bible-themed word searches (for example, "Places in the Bible"). Scroll down for the list of word searches. Note: Looking for regular word searches, not special needs? 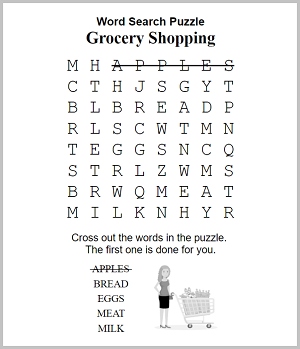 See the Word Search Printables page. If you teach a special needs class, you might want to have your students work on one of these puzzles for a few minutes before each lesson. Or if you are a parent or caregiver, print out a few of these for your special needs child or adult as an activity that is both fun and appropriate for their level of development. Here are the special needs word search printable pages. Click the link to open a printable version of the word search in a new window. For the solutions to these puzzles, click the "Solution page" link provided. Don't see the special needs word search you need? I might be able to make it for you, for free. Scroll down for more information. The word search pages are in PDF format. Click the link to open the word search in your browser. Most computers should be able to view and print out these puzzles with no problem. I was inspired to create these special needs versions by a request from Joan at Hope Church in Mason, Ohio. The Hope Church Special Needs Ministry needed additional printable activities within reach of their special needs children and adults ages 6 to 24. I realized I could take regular printable Bible word searches puzzles I had already created and make them simpler. Thanks, Joan, for the idea! Because you took the initiative to reach out, special needs caregivers all around the world now have access to this collection of free special needs word search puzzles, too. These special needs word searches have been simplified to allow those with learning disabilities or other cognitive challenges to understand and solve the puzzles more easily. Individuals who may benefit from these special needs word search puzzles include those with autism, Down's Syndrome, attention deficit hyperactivity disorder (ADHD), traumatic brain injury (TBI), or learning disabilities in general. Older people with moderate cognitive impairment or early stage dementia (Alzheimer's, Parkinson's, or other types) may find these word searches accessible as well. The standard free word searches on this site consist of 15 rows and columns with words hidden vertically, horizontally, diagonally, and backwards (for example, "Lydia Learns to Follow Jesus", Acts 16:11-15). This level of difficulty may prove too challenging, even overwhelming, for a person with cognitive special needs. The word search puzzles on this page are less complex. They are smaller in size (for example, 8 x 8 rather than 15 x 15) and contain fewer hidden words (for example, 5 words compared to 15 or 18). In addition, words in the easiest puzzles here are oriented in simple, left-to-right normal reading order. The puzzles are also much larger in size and thus easier to view by the visually impaired. The word searches on this page are free for unlimited personal use as well as free for unlimited use by any organization including churches, non-profit or for-profit companies, government agencies, schools, clubs, and volunteer groups. You can email these special needs word search puzzles to anyone and print as many copies as you need. Basically you can do whatever you want with these special needs word searches as long as my copyright notice remains on the puzzle page. However, you cannot sell them. Need More Special Needs Word Searches? If you have an idea for a printable Special Needs Word Search puzzle, send me the list of terms and I'll make a puzzle for you for free. For the simplest puzzles, include about 5 terms. Please provide a title for the word search (for example, "Astronaut Word Search"). Use the form on my Contact Me page to send your request.